This print is the epitome of Glory Box Designs- from our "Obnoxious Weeds" range it 'celebrates' the unwelcome invaders of our beautiful country and cheekily attempts to dress them up. This print cushion, loving designed from hand drawn cane toads, is printed and slow made by Glory Box in this seasons hottest colour Wild Orchid, with indigo outlines on a loose weave candy coloured linen. With a double fold backing in a durable poly-blend and fastened with a one-of-a-kind Glory Box resin button this cushion is easy access without scratchy zips. 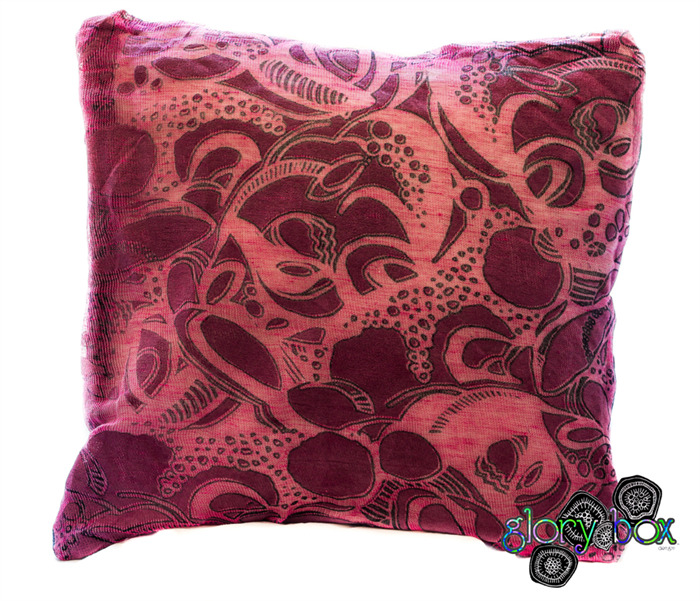 This cushion measures at 42cm, and will plump out nicely with a 45cm insert (not incl.) These are the only two of it's kind so consider buying the pair, lest the one gets lonely.